Hi, I am interested in your 1968 Chevrolet C/K Truck (stock #4718-ATL) listed on Autotrader for $29,995. I'd like to get more information about this vehicle and confirm its availability. 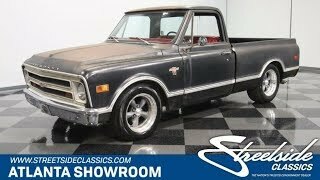 This 1968 Chevrolet C10 Restomod has the look and every bit of the vibe of the modded vintage truck it truly is, but it also offers a level of mechanical functionality rare for a pickup from its era. While its 60s era counterparts came part and parcel with often unpredictable all-weather starting and gas guzzling high revs at highway speeds, this Chevy has both those challenges solved to offer a driving experience youll actually look forward to. The lightly weathered, seen it all aura of this pickup grabs you from the first glance. Its broad front end comes via a major design upgrade Chevy embarked upon just a year before this 68 came out, and the flat black paint it wears has just the right amount of patina -only at surface level - to stand as a badge of its faithful service over the years and really makes for a distinctive appearance. Its got a great stance - lowered about 4-5 from stock to provide a definite hotrod touch while still leaving enough wheel clearance for driving in real world situations. Aftermarket side mirrors are now in place to add a little contrast against their intentionally weathered backdrop and the front and rear bumpers, though almost certainly original, sit straight and level and show no major dings. A half century of life has left this Chevy still looking straight and solid and its body panels line up impressively well - the prominent stretches of side trim are very even as they span the distance between the front and rear wheels. A nicely detailed and fresh interior waits beyond the doors. At its center, the leather-wrapped bench seat appears nearly new and looks great above the expanse of fresh carpeting lining the floor. Above, the interior roof has been painted black, along with the inner door jambs, door panels, glove box and dash to provide a very effective two-tone effect inside. The instrument panel sits in front of an upgraded, classic style steering wheel and looks very fresh, with its clean panel surrounding nice clear gauges and a separate display has been added to keep closer tabs on operating temperatures while a new leather dash pad spans the width of the cabin. Below, the updated pedal assembly provides a more modern feel while accelerating and braking, which really comes into play during stop and go driving. The bed area in back is straight and solid while showing just the right amount of surface patina to keep it in balance with the rest of the truck. A 5.3 liter V8 now resides under the hood, featuring electronic fuel injection to provide a level of all-weather dependability well out of reach of the original engine and it teams with a 4-speed automatic 4L60E transmission whose overdrive gear makes for nice, low revs at highway speeds. The 3.73 rear end equips the drivetrain with both spirited off the line capability while still not driving RPMs too high. The dual exhaust leads to a pair of FlowMaster mufflers in back, so the powertrain sends out a nice, deep note with just a tap on the pedal. This Chevy offers a nice, refined driving experience that might come as somewhat of surprise, given its vintage. In addition to its post millennial powerplant, youll find coil springs in both front and back, while power steering makes it easy to navigate and power brakes that position discs up front bring its set of 17 Torq Thrust style wheels to dependable, low effort stops. With is straight and subtly weathered look combining with plenty of modern, dependable power, this 1968 Chevrolet C10 Restomod is a great match for the classic enthusiast who also puts a premium on overall driving experience. Call today!